Banglalink 110 Minute 43Tk Offer! Banglalink has provided for their valuable prepaid and postpaid customers are eligible to Banglalink 110 Minute 43Tk Offer. The customers who are searching to know about the Banglalink Minite offer and Banglalink Bundle Offer, just follow our article to get all more update information. Here we will share for all customers to know about how to activate Banglalink 110 Minute 43Tk Offer details. Only Banglalink has given to their users is the lowest call rate offer. 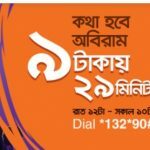 To activate Banglalink 110 Minute 43TK Bundle Offer 2017, Customers need to recharge exact 43 TK from i-topup shop or please Dial USSD Code *1100*5*3#. VAT + SD + SC includes in recharge amount 43 Taka. The validity of Banglalink 110 Minute 43 TK Bundle Offer 72 hours, that’s mean validity 3 days. The Banglalink 110 Minute Bundle offer is a Regular minute offer. So, Customers can activate this BL 110 minute Bundle Offer 43 TK as many times as they want. 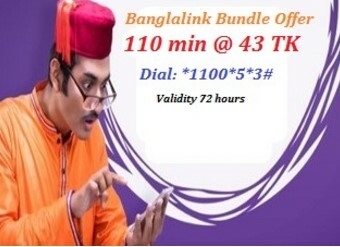 Customers can use this Bangallink 110 min bundle offer only Banglalink number and uses time 24 hours in a day. To check your minute remaining balance,please just Dial *121*17#. To know more Banglalink Minutes Bundle Offer 2017, Dial *1100# (charge Free). Now all Banglalink users can get all more update news to about the Banglalink 110 Minute 43Tk Offer details. Here you can also get Banglalink 74 Minute 24Tk Offer. If you want to know more or face any problem to activate this special minute offer, just comments the bellow box. We will try best to solve your problem. Thanks to all customers for visit our site for long time and waste your valuable time with us.